Take a Photo of your Plate. Get a nutritionist's Tweak Just Before You Eat! It has the users current and past tweaks, with the nutritionist comments, and Nutrition Labels. Also has the rating you gave for every tweak. 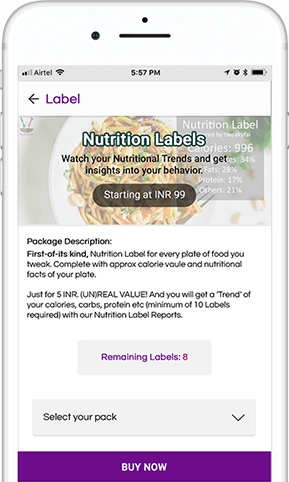 Nutrition Labels, helps users see the macro-nutrient profile (Calories, Carbs, Proteins, Fibre, Fat, etc.) of every meal. 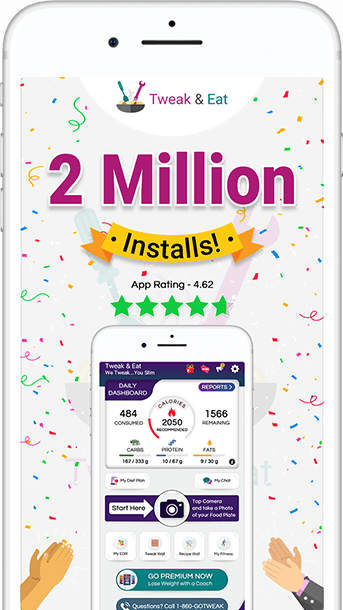 It’s created almost instantaneously by our AI platform tweakyfai. Healthy Eating at your fingertips. Cook, Fix or get it delivered hot! 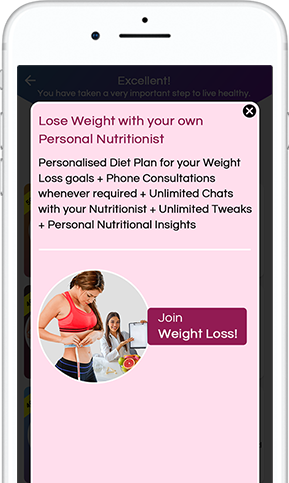 ‘My Nutrition’ helps users monitor their calorie and macro-nutrient consumption trends. Tweak & Eat now supports integration with devices like fitbit, iWatch etc. The most advanced and the most affordable weight loss service ever. Get a personalized plan from your assigned nutritionist(s). Every tweak goes directly to your assigned nutritionist(s). Just follow the nutritionist inputs while you are eating and watch those pounds melt away! 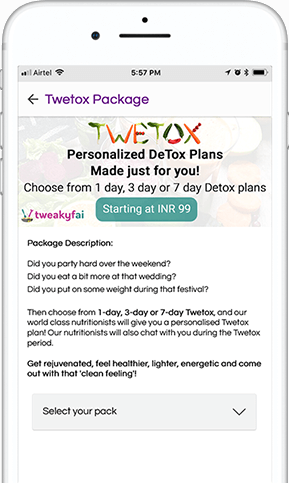 Very affordable personalized Diet Plans, generated by our AI platform tweakyfai. 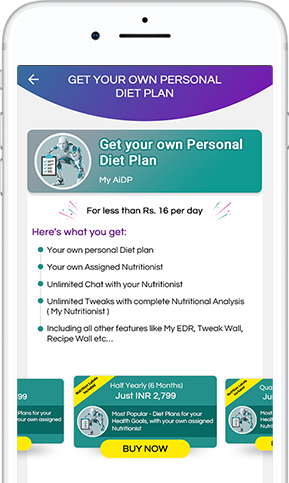 You get to chat with our nutritionists one week after you purchase the Diet Plan as well. Look Good! Detox plans to get your body rejuvenated. Choose from 1-day, 3-day, or 7-day package. Buy a pack of 10, 20, 30, 50, 90, 180 or 360 labels. Ensure every plate has a Nutrition Label and watch the Calorie and Macro-Nutrient trends. Trend is your friend! It has been very tough for me to give up some foods i have been used to having, like rice etc. So have been unsuccessful in my weight loss so far. I tried this app - i never got a tweak back so far saying ‘don’t eat this’. This kind of made me use it more and more. I’m feeling better since i’m consciously controlling the portion size based on the comments i get back. ‘My Trend’ has begun to dip down and i’m very happy! Guys - Hats off. This is a masterpiece app for weight loss. Taking a photo - i can do. The rest you do, and you do it very very well. Really Hats off! Wow – you guys have made this so easy. I bought a diet plan (AiDP) because my ‘calorie’ was trending UP. Fantastic value! 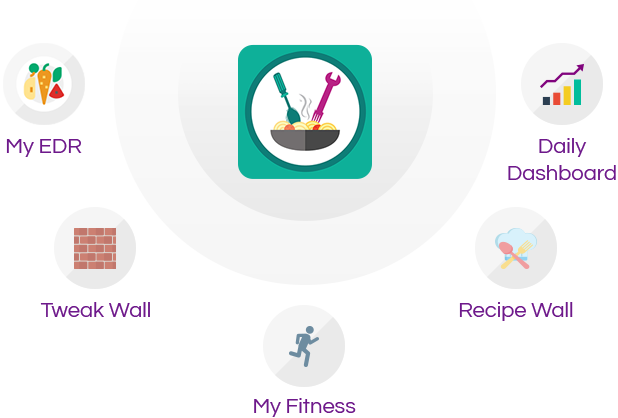 Cooked 2 recipes from the recipe wall – I love to cook and I watch what I eat. So, I cooked it and tweaked it, only to get a big thumbs up for my plate from the nutritionist. Proud! good for monitoring my diet! Great app, works perfectly and motivating ...! A very good application.. Its very informative and motivating. Thanks for coming up with such a thought.